Let’s not pretend anymore and just admit to the inevitable truth that the entire world is already aware of: Americans have big egos. That’s probably why we love building these silly American roadside attractions that are “the world’s biggest” whatever, whether that ends up being just a really big ball of paint or an unnecessarily large ball of twine. Perhaps that’s the need for our strange roadside attractions: USA residents and towns want to be the best! Should we have the world’s largest bug? What about the largest chainsaw? What about the largest stuffed steer? Why ask “why”? Bigger is better in America! Besides Americans’ desire to be the “winners” in a game no one was playing, we’ve created these wild, gaudy, silly, and odd roadside attractions to try and inspire drivers to stop after the next ten, 20, or 100 miles. We have roughly 4 million miles of road, with 2.6 million miles paved. Compare that to, for instance, the UK, which only has an estimated 213,750 of paved roads. There’s a lot of nothing on a US map, and encouraging drivers to stop their monotonous, mind-numbing drive for just a second, even and especially for something silly, can help an entire community’s economy. In the 1920s and 1930s, these types of attractions became very popular. It’s clear that the Great Depression had an impact on the traditional US road trip map, now full of funny, wacky, and weird stops along the way. While many of these gaudy stops faded after the National Interstate and Defense Highways Act of 1956, which made the highways faster and less irregular and thus less interesting, many of these fun attractions have stayed around for decades. So how you do you get them to pull over? There are a couple of strategies, one of the most famous being the taunt, involving a series of teasing billboards that are meant to create creeping anticipation that eventually overwhelms the driver with curiosity. One of the most famous, and honestly the best roadside attractions that uses this tactic is known as “The Thing” in Arizona. More than 200 billboards in either direction advertise “the Thing” for thousands of miles, with quirky lines inciting mystery. We won’t spoil what it is when you get there, but admission is only one dollar! The 120 South of the Border billboards that line the East Coast’s I-95 have been delighting drivers with their annoying puns for years along their road trip. Funny, vague attractions like the Oregon Vortex and the Mystery Hole are equally tantalizing as well. Museums About Things You Didn’t Know You Cared About Until Now: Did you know there was a museum dedicated to potatoes? Don’t you want to know how they make such a dull topic so interesting? Weird Climate Switches: One doesn’t expect to find a desert in Maine, for instance. Swiping Landmarks From Other Countries: Our large ego is also likely why we love imitating other country’s landmarks, like Stonehenge, which has been imitated in Alabama and Nebraska. Living the Fantasy: Building giants, trolls, dragons, and dinosaurs has always been a great tactic for a stop. Just look at the Jolly Green Giant and the Fremont Troll! Which of these strange spots will steal your heart? 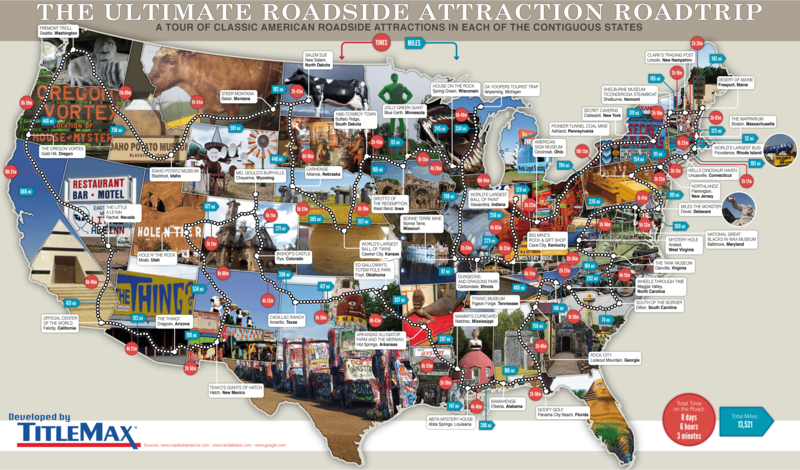 Have fun exploring this great country’s weird roadside attractions, map your own destinations, and enjoy the great, natural reaches of this huge country this summer!